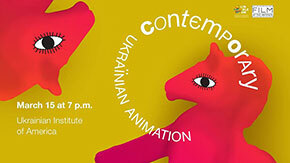 The Ukrainian Institute of America in collaboration with Linoleum International Contemporary Animation and Media Art Festival present a compilation of Ukrainian Contemporary Animation from the most renowned authors. These films produced in 2013-2018 made strong steps towards the rebirth of the animation art as well as represented Ukraine at the international level. The event will take place March 15 at the Ukrainian Institute of America in New York. This program features eight Ukrainian films in different styles created during the last five years and recognized in their motherland. The Shop of SongBirds from an experienced animator Anatoliy Lavrenishyn is a visually rich tale with oriental and steampunk aesthetics mixed in. A well-known Ukrainian singer Katya Chilly was involved in the sound design for this film. In general, Ukrainian animators successfully collaborate with famous musicians: the examples of this are two music videos offered in the program. In The Monk, a new music video to a song by DakhaBrakha, Sashko Danylenko combines ethnical motives with an original comic-book style. On the contrary, Oleg Shcherba in his video work for a folk band Zapaska turns to universal suprematist forms. Two works from the program have become Ukrainian audience hits for young and old alike. These are The Gum by Olha Makarchuk, a fun fantasy inspired by everyday objects only an animator with rich imagination can notice. Challenging but close-to-home ideas have laid the foundation for a contemporary fairy tale The Fish-tailed Girl from Chervoniy Sobaka animation studio, which is considered a local brand of colorful plasticine animation. And the real spirit of adult indie is embodied in two works from Dnipro animators. THE END by Nikita Lyskov is an absurd kaleidoscope of comic and tragic scenes of approaching apocalypse where a connection with Ukrainian social realia can be identified. Another author Stas Santimov in his film Eluvium – Regenerative Being draws a dark surrealist world with the help of disturbing images; this world is intuitively understandable for a viewer from anywhere in the world. General Admission $15. UIA Members free.